Exclusive flower alert! We are delighted to bring to you the combination of 50 shades of pink, gathered in just one peony. Candy Stripe is a bizarre phenomenon: every flower is unique. This makes this flower even more special to us. 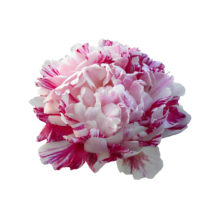 Candy Stripe is a flamed peony with pink and white as basic colours. Wings of red and cerise are also visible. The flowers are completely double in a beautiful rose shape. Candy Stripe is a creation by Anderson. She was registered with the American Peony Society in 1992. Anderson has also brought Canary Brilliants to life. We are pleased that we have been able to find a peony wizard who has planted Candy Stripe. We hope to see them bloom in 2021. That means that these flowers are rare. Only a limited amount will be available from 2021 onwards. Make sure to keep track of them. They will be gone in the blink of an eye.